20 Pork cocktail sausages, 20 Lincolnshire cocktail sausages and 20 Cumberland cocktail sausages individually packed. 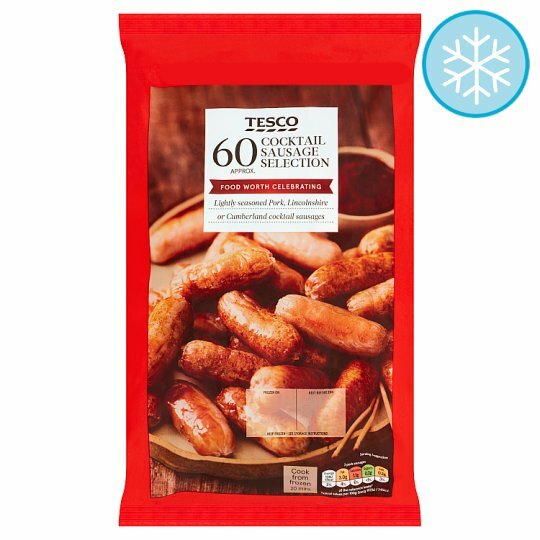 Our variety pack of frozen cocktail sausages has three great family favourites in one pack. All three of these sausages cook from frozen in 18 20 minutes. Choose from herby lincolnshire, peppery cumberland or a lightly seasoned pork. Great finger food for any party. Instructions: For best results cook from frozen. 190°C/Fan 170°C/Gas 5 Remove all packaging. Place on a baking tray in the centre of a pre-heated oven for 18-20 minutes. Turn halfway through cooking. Pork (56%), Water, Wheat Flour [Wheat Flour, Calcium Carbonate, Iron, Niacin, Thiamin], Pork Rind, Pork Fat, Salt, Stabilisers (Tetrasodium Diphosphate, Disodium Diphosphate), Ginger, Mace, Nutmeg, White Pepper, Yeast Extract, Preservative (Sodium Metabisulphite), Flavouring, Antioxidant (Ascorbic Acid). Filled into non-UK beef casing. Pork (56%), Water, Wheat Flour [Wheat Flour, Calcium Carbonate, Iron, Niacin, Thiamin], Pork Fat, Pork Rind, Salt, Parsley, Sage, Stabilisers (Disodium Diphosphate, Tetrasodium Diphosphate), White Pepper, Ginger, Mace, Nutmeg, Yeast Extract, Preservative (Sodium Metabisulphite), Flavouring, Antioxidant (Ascorbic Acid). Pork (56%), Water, Wheat Flour [Wheat Flour, Calcium Carbonate, Iron, Niacin, Thiamin], Pork Fat, Pork Rind, Salt, Stabilisers (Tetrasodium Diphosphate, Disodium Diphosphate, Sodium Triphosphate), Black Pepper, White Pepper, Nutmeg, Preservative (Sodium Metabisulphite), Sage, Antioxidant (Ascorbic Acid).